Photo of me wearing a Panamanian hat while in Manta, Ecuador. Tom insisted I finally post a photo of me by myself as the main photo which I've never have done (not that we can recall). Hazy day view of Manta, Ecuador. Late yesterday morning we boarded the shuttle bus from the pier for a ride into Manta, Ecuador. Once we were dropped off at the local park and shopping area, the sights, the smells and the sounds left us reeling with excitement and we decided we wouldn't take a taxi tour of the city. La Merced Catholic Church in Mnta, Ecuador. Hat making in Manta at the flea market. "Manta is a mid-sized city in Manabí Province, Ecuador. It is the second most populous city in the province, the fifth most populous in the country. Manta has existed since Pre-Columbian times. It was a trading post for the Mantas. A vendor with bicycle cart selling beverages. According to the 2001 census, the city had 192,322 inhabitants. Its main economic activity is tuna fishing. Other economic activities include tourism and a chemical industry with products from cleaning supplies to oils and margarine. The Panamanian hat is a popular tourist purchase in Ecuador. Manta possesses the largest seaport in Ecuador. The port was used by Charles Marie de La Condamine upon his arrival in Ecuador when leading the French mission to measure the location of the equator in 1735. From Manta, Condamine started his trip inland towards Quito. Manta has an international airport, Eloy Alfaro International Airport with passenger airline service, and an important military base (known as Manta Air Base or Eloy Alfaro Air Base). View of the market in Manta. Between 1999-2009 Manta Air Base was used by U.S. air forces to support anti-narcotics military operations and surveillance flights against Colombian drug trafficking cartels. The lease was not renewed by the Ecuadorean government. Manta has recognized thanks to its international film festival featuring groups from different places in the world. The Ecuadorian actor Carlos Valencia, once invited to Cannes Film Festival for his performance in Ratas Ratones y Rateros (1999) directed by Sebastián Cordero, who was born in the capital city of Quito." Colorful handmade jewelry for sale at the market. I was practically squealing with delight as we wandered about the vibrant city so full of life and energy it was intoxicating. Although there was an endless number of vendors pushing us to make a purchase of a variety of pointless trinkets, we politely made our way through the crowds, having a great time. An iguana, among dozens, hanging out in the park. From time to time, we ran into passengers we've met who were on an equally enjoyable outing in this quaint oceanside town. It couldn't have been a more perfect day. A variety of trinkets may appeal to the tourists. Knowing we had to be back at the ship by 2:00 pm to sail away, we stayed focused on photo taking which we'll share today and again in tomorrow's post. We had no idea we'd encounter dozens of iguanas in the central city park, easily finding ourselves entrenched in taking their photos. Colorful scarves for sale in the market. The iguanas seemed to pose for us. They appeared relaxed and at ease in the presence of humans in the busy park, exhibiting perfect poses and a willingness to cooperate with tourists, like us, hungry to include their photos in our repertoire of unusual animal shots. This vendor was selling the white rabbits in the cage and the two white puppies that tugged at our heartstrings. We continued on our walk through the town, stopping from time to chat to chat with other cruise passengers and admire the crafts of locals. At the craft fair/open market, I purchased a white "senorita-type" dress and shawl for tonight's "evening chic" attire aboard the ship. An ice cream man with a cart. Both the dress and handmade shawl/scarf were a total of US $27 after a bit of negotiation. I haven't owned a dress in the past four out of five years and I was thrilled to have the festive ensemble which most likely I'll wear again on my special birthday, upcoming in Marloth Park on February 20th. A man peeling oranges to sell. We rarely purchase anything at these tourist shopping sites but when I saw the dress hanging in a little shop, I couldn't resist. It's sleeveless so I purchased the shawl to keep me warm in the evening. They keep the AC awfully cold and I'm generally shivering while indoors. Even outdoors, it's been cool since we left Fort Lauderdale a week ago today. Iguana climbing a tree in the central park in Manta. It's hard to believe a week has already passed since we sailed from Fort Lauderdale, Florida. We're having such a great time meeting new people while passing out hundreds of our business cards and subsequently adding new readers to our site. Iguana posing for a shot. Sharing our story with readers worldwide means the world to us. Thank you for being on this journey with us! One year ago today, huge Colony Club was also packed for our second presentation aboard the ship. For more details, please click here. Day 7...Cruise to South America...Part 2, The Panama Canal...A repeat of an outstanding experience...Today? Hola Equador! Some freighters can carry as many as many as 18,000 20 foot containers. This freighter was being guided through the Panama Canal at the Miraflores locks. "Sightings from the Veranda while Cruising"
Panama City which we spotted toward the end of the transit through the canal. The concept of transiting the Panama Canal beginning at the Atlantic Ocean/Caribbean Sea to ending up later in the day in the Pacific Ocean is an engineering feat we can hardly wrap our minds around. Target practice for the "rope throwers" who toss the cables to the ship to guide them through the channel. Contests are held for the workers who compete using this target with big monetary prizes. Transiting the Panama Canal was as exciting for us the second time as it was the first. Although we didn't transit the newly built locks which is reserved for much larger ships, at a few points we were able to glimpse it at a distance. It was a rainy cloudy day and visibility was limited. In any case, we were equally in awe of this breathtaking man-made waterway with locks and dams, a true feat of engineering built in 1914 after 10 years of construction and loss of many lives. Another container ship in the lake awaiting entering the channel. A Silver Seas luxury cruise ship in Miraflores Lake. We're still reeling from yesterday's great day at sea which proved to be filled with many interactions with fine people who surprisingly knew us from our site. We're still in a state of shock over being approached by people who "happen to know us." A barge with a tugboat used for moving materials that have been dredged in the channel. After everyone wandered off for lunch we finally finished the post in the cabin when my laptop battery died. Afterward, we visited the Future Cruise on deck five to book four more cruises since they were having a "Black Friday" cruise deposit sale. This meant we could book several cruises for a deposit of only US $25 per person as opposed to the usual US $450 per person (when off the ship). We booked four cruises knowing full well, we'd never actually take those specific cruises. "Herman, the German," one of the largest floating cranes in the world at 208 feet high stays in the Panama Canal region. See here for details. Instead, we have the right to move the deposits to any other Celebrity cruises we'd like at any time in the future. Although we won't be going on any cruises in 2018 while we're in Africa (after the Antarctica cruise), we'll certainly be planning for future cruises in 2019 and thereafter for which we'll transfer these deposits. Private watercrafts pay fees from US $800 to US $3,200 (depending on size) to transit the Panama Canal. After the cruise booking process was completed, we headed back to the cabin to shower and dress for the two-hour Captain's Club in the Constellation Lounge where the free drinks flow with abandon. Another wonderful couple we'd met a few nights ago joined us, Annwyl and Ted, from Canada. The time passed quickly as we engaged in animation chatter. Finally, we headed to the Trellis Restaurant for dinner where, once again, we had a delightful dinner sitting at a table for 10. Gosh, it couldn't be more fun. The crew aboard the sailboat transiting the Panama Canal. Finally, by 10:30 pm, we headed back to the cabin when there was little activity on the ship. This ship has no specific "Centrum" which makes after-dinner entertainment scattered throughout several bars. Having had sufficient cocktails and wine, we wandered off to our cabin, not falling asleep unto after midnight. Few homes are located in the area. I've been nursing one glass of red wine each evening which seems to have no ill effect. It certainly tastes good. I'll order a bottle of Perrier along with the glass of wine and sip back and forth between the two making the wine last through the evening. I wish I could have a second glass but I'm not going to push my luck when I've started feeling so much better. Above all, we must always consider maintaining good health. The Miraflores locks as we entered. Tom's been amazingly cautious in what's he's eating and drinking to avoid a big weight gain. After all, this is a 30-night cruise and we'll be eating out every day until we get settled in South Africa around February 10th. Our ship, as it ends its transits through the third and final set of locks. The opening of the gates to the locks. We won't have a lot of time when we all have to be back onboard by 2:00 pm for an early "set sail." We'll be back tomorrow with what we've discovered. This cruise, as most, provides us both with a high level of socialization and memorable times together. We continue to be grateful for each and every day. May you have a memorable day! Tom with his back to the first locks, was surprisingly alert during the 12-hour stint in the Constellation Lounge where we watched the events unfold. A little worse for the wear after getting up before 4:00 am. It was a fun but long day. Tourists, at a public viewing area, watching our ship pass through the final set of locks of the Panama Canal. We neared the entrance to the first set of locks. The photos from the two above links will clearly illustrate how far we've come in our desire to take photos to include here each day. Regardless, our photos over these next few days aren't perfect either. In order for the ship to stay in the center of the narrow channel through the locks workers tie ropes/cables to the ship to maintain it's center position to avoid damaging the sides of the ship. The reason for this was the fact that we opted to sit comfortably in the front row, center, closest to the windows in the Constellation Lounge located at the bow of the ship on the 11th deck. The bluish tint of the glass had an impact on each of our photos. Notice how close this cargo ship is to the walls of the passageway. After little sleep the prior night, neither of us felt motivated to stand outdoors in the rain. And, after the day began to clear, we didn't want to forgo our great seats by getting up and heading outdoors to the deck. The Constellation Lounge was packed with passengers trying to see the transit through the canal. Tom had set his phone's alarm for 5:00 am but, worried about getting up, he awoke at 3:30 am yesterday morning concerned about us getting good seats. After a quick shower and dressing, he dashed out the door carrying our laptop bag with a plan for me to find him after I got up and ready for the day. Frigates sitting atop a light fixture at the canal. No more than a minute after he left the cabin I was out of bed on a mission to get out the door in less than 25 minutes. Mission accomplished. By 4:30 am, I found him "front row center" in the Constellation Lounge with two comfy chairs and a small cocktail table for our use, the perfect setup for the long day ahead. The canal operates with gravity with water flowing from the lake to the locks, moving in and out again, raising and lowering the ship to the appropriate heights in order to traverse through the many locks. There are three sets of locks on each end dividing the Atlantic and Pacific Oceans. The first set of locks raises the ship to the lake level since the Atlantic side is lower. On the Pacific side of the lock, the ship is lowered to sea level. Luckily and somewhat surprisingly there were few others waiting so early for the upcoming day's events. It was raining hard and we'd expected many other passengers to plan ahead as we'd done. Cables are attached to these vehicles, called locomotives, aka "mules" in order the pass through the channel. There are three of these vehicles on each side; one on the bow; one at the center of the ship and the last at the aft section for a total of six. Each of these vehicles cost over $2,000,000. These are the third generation of mules since the locks opened in 1914. By 8:00 am, when we entered the first set of locks, the huge room was packed, some in chairs, others standing and many sitting on the floor bound and determined to have an opportunity to see what was transpiring on the rainy day transit. It was interesting to watch massive freighter pass through the locks. Conversations rolled out with passengers sitting near us as I busied myself getting yesterday's post completed and uploaded, let alone answered dozens of comments and questions we'd received via email in the prior 24 hours. On the left is a huge chemical/petroleum freighter. We love hearing from our readers, making every effort to reply in 12 hours and certainly in never more than 24 hours. 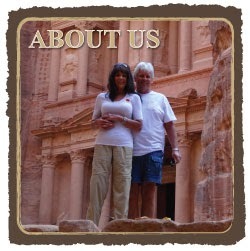 Having our readers "travel along with us" is an indescribable perk to our world travels. Now, on this ship, the Celebrity Infinity we've had countless opportunities to chat in person with many readers who've followed along with us over these past years. This always surprised us and we never take these visits for granted. As we entered the first set of locks at Gatun Lock at the Caribbean/Atlantic side. How'd we get so lucky? Many have explained our candor, vulnerability, and generally upbeat mentality has kept them interested in reading our posts year-after-year. A few have mentioned that our occasional worry, concern along with a bit of "whinging" (whining) also adds to the value of reading our site, making it more realistic. Nothing is "perfect" in this life. As the day wore on, sitting in those chairs, from time to time I found myself nodding off, unable to take one more photo or even get up from my chair except when absolutely necessary. The control house from which the mules/locomotives pass around and through. By 4:00 pm, after almost 12 hours seated in the chairs, we both ran out of steam although at that point we begin the transit through the third and final lock. We decided we could watch the balance from our veranda. We needed to shower and dress for Captain's Club Happy Hour which generally is held in the Constellation Lounge and was still packed with the viewing audience. Instead, the daily event was moved to the roomy Rendevouz Lounge where we headed at 5:00 pm for free drinks for two hours. Sign on the outside of the control house. While there, we met a lovely couple and the two hour period passed in a flash and finally it was time to head to the Trellis Dining Room for dinner. Again, we were seated at a "sharing table" for yet another good meal with other passengers we'd yet to meet. How fun it is...meeting new people each evening and sharing our mutual travel stories. Everyone has a unique story to share and our lives, although often provoking lots of questions, is not so unique to the world travels of many other cruise passengers some of whom may embark on eight or ten cruises a year. Mule/locomotive exiting the control house at Gatun. We've yet to meet a couple who are homeless like us but we've many who have no fixed home in their home country but travel by RV from area to area. But, this type of travel although thoroughly enjoyed by many is not for us. We love the ability to travel from continent to continent, country to country. This morning, we're late in posting. We met John, a retired airline pilot, who stopped by a four-person table at Cafe al Bacio for a lengthy visit, every moment of which we both thoroughly enjoyed. Later, one of the fabulous guest speakers joined the group of us. Many passengers stood on the helipad to watch the events roll out. We were content to be seated indoors out of the rain and wind. And later, Sue and Bob, long time readers of our site, planning on traveling the world in the near future, stopped by with the warmest of hugs and attention, for yet another lively and meaningful few hours of conversation. Wow! Afterward, after everyone headed to lunch, we were alone to get back to the pleasing reality of our lives. We had a post to write and get uploaded to the Internet before our worldwide readers began to worry if we haven't forgotten about them. We haven't. We love having YOU with us on this journey and all others. As we began to wind down our 33-night cruise, we spotted this stunning sunrise over an industrial port in New Zealand. For more photos, please click here.